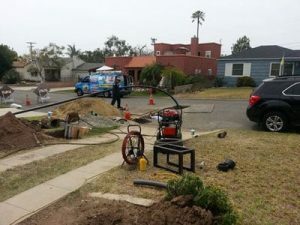 Trenchless sewer repair has gained popularity with property owners in recent times. This is due to the fact that the advanced sewer repair process relies on technology as opposed to digging holes. In the past, there was only one way that plumbing contractors could fix broken sewer pipes. They had to excavate long and deep trenches. Once the sewer pipeline was physically exposed they could make the necessary repairs. Many sewer pipelines are hundreds of feet long so the trenches often caused a significant amount of damage to the landscaping and hardscaping. This requires the destruction of anything above the pipes such as the lawn, trees, flowers, shrubs, mulch beds, driveway, sidewalk, patio, or parking lot. Interestingly enough the plumbing contractor is not responsible for replacing the damaged landscaping and hardscaping. Once the sewer pipe repair or replacement work is finished they simply fill in the trench with dirt and move on to their next customer, a process that can last for weeks. That means that anyone residing in or working at the property is without plumbing, including the use of any water sources and toilets, for the duration of the project. Fast-forward fifteen years. Although the plumbing industry as a whole is slow to adopt new technology there are a few sophisticated companies that not only believe in technological advancements they have taken the process one step further. For example, our trenchless pipe lining procedure, developed by Nu Flow Technologies, allows forward-thinking plumbers to perform sewer pipe repair work without the need to physically expose the sewer pipeline. Instead of excavating a large and destructive trench only a small access point is required at one end of the sewer pipeline. A high-tech machine installs a tube into the sewer pipes through the small access point. The tube contains an inflatable air bladder and an outside liner that is saturated in a specially formulated wet epoxy resin. When the tube is inflated the wet epoxy resin is applied to all of the interior surfaces of the sewer pipes. The tube is then deflated and removed in order to allow the wet epoxy resin to harden. It takes approximately two to three hours for the epoxy resin to fully cure in place. Once it does a brand new pipe liner or pipe within a pipe is formed. Any chips, cracks, or small breaks in the sewer pipes are permanently sealed. The new liner also prevents future damage to the old sewer pipeline from negatively affecting the system, as it will last for well over fifty years. The entire Nu Drain trenchless pipe lining process takes as little as one day to complete from start to finish and costs approximately half the price of the traditional excavation method. Nu Flow Technologies provides the solution that you need in order to have your sewer repaired quickly, correctly, and at a cost-effective price. We look forward to showing you the difference that trenchless sewer repair technology makes. Please contact us today.